To be Christ in our community and to bring our community to Christ. We are most grateful to God for His goodness to us here at FIC and for the opportunity to participate in the extension of God’s kingdom in our community! Building a new multi-purpose church facility is an essential part of believing God for continued growth. Building Fund Target (2018-2020): We are seeking to raise commitment of pledges for $250,000 and additional gifts of $50,000. Pledge packages include an informative letter with drawings of the new building, pledge cards, giving options (on back of pledge card) and return envelope. These are available to members and friends of FIC. 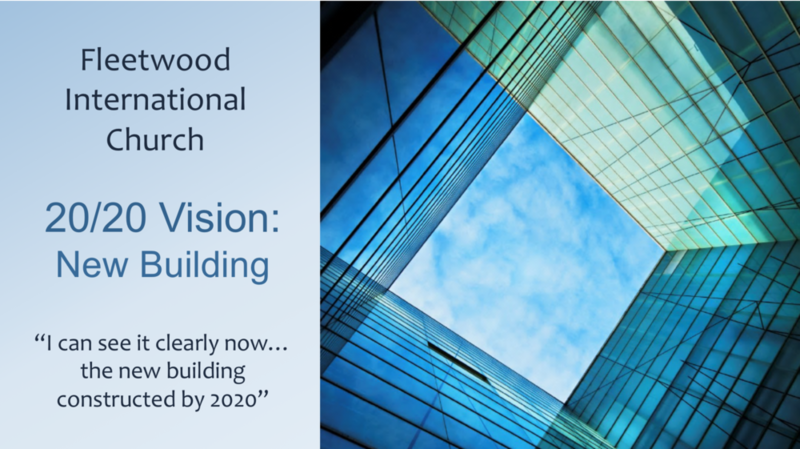 Building Projections: Our 20/20 Vision is to see the new building constructed by 2020. Rezoning for a larger congregation, the plans are to build a new church facility connected to the present building. We anticipate the provision of funding in order for the construction of the new building to then begin. We will trust God for provision of funding from pledges, special contributions and growth in our congregation to support a mortgage upon completion of the building. Q&A: There is opportunity to receive further information and dialogue with FIC Leadership regarding the vision for our new church building at Ministry or Life Group meetings. You may also receive updated information by email or request a home visit by a church leader. Contact the church office for more information at 604-597-2151.